A group of companies from the energy and shipping industries have partnered to reduce carbon emissions from the ocean transportation of biomass fuel cargo to the UK’s largest power station through the design of a concept cargo ship equipped with innovative sail technology. British electrical power generation company Drax operators of Drax Power Station located in North Yorkshire, UK, is partnering with the Smart Green Shipping Alliance Ltd (SSGA), Danish dry bulk cargo transporter Ultrabulk A/S and Humphreys Yacht Design, the naval architects of Dame Ellen McArthur’s ‘Kingfisher’ yacht, to collaboratively tackle the issue of CO2 emissions from the shipping industry. A GBP100,000 12-month feasibility study funded by InnovateUK, the Institution of Mechanical Engineers (IMechE) and private investors has commenced. The study will examine the potential of retrofitting innovative sail technology called Fastrig onto an Ultrabulk ship importing biomass into the UK for Drax, to produce renewable electricity. This study’s purpose is to find cost-effective ways to reduce the carbon intensity of the ocean transport required in the biomass supply chain. The first six months of the study will focus on assessing the technical feasibility of the project, establishing the engineering parameters for retrofitting Fastrig technology onto ships; the next six months will focus on calculating detailed costings for the project and building the business case. Depending on the outcomes of the feasibility study, the launch of the Commercial Demonstrator could be as soon as 2021. Whilst it is the most efficient form of cargo transport, the shipping industry emits roughly 3% of global CO2 and other greenhouse gas (GHG) emissions (CO2-equivalent). 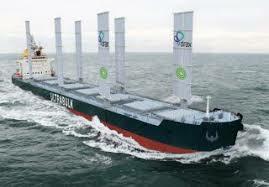 This equates to ships emitting approximately 1 billion tonnes of CO2 and other GHGs per year. Therefore, the shipping industry’s emissions are double that of the UK’s total emissions from all sources. Drax has demonstrated how ambitious decarbonisation can transform traditional industries by converting two thirds of the power plant’s capacity to use sustainable biomass instead of coal, making it Europe’s biggest decarbonisation project. Last year, Drax imported 6.8 million tonnes of biomass, in the form of compressed wood pellets, in 221 deliveries to the ports of Immingham, Hull, Tyne and Liverpool enabling the generation of 14% of the UK’s renewable electricity. The use of biomass at Drax Power Station has delivered carbon savings greater than 80% compared to coal use – a figure that is inclusive of supply chain emissions. However, ocean transportation remains one of the most carbon intensive elements of the biomass supply chain. Drax’s demand to further reduce carbon emissions enabled the Smart Green Shipping Alliance to partner with an ‘end user’ looking to drive low carbon shipping for biomass cargo delivery. The project is led by Diane Gilpin, CEO and Founder of Smart Green Shipping Alliance and expert member of the UK government’s Clean Maritime Council. The SGSA has been pioneering the uptake of renewables in the maritime industry since 2014, identifying wind power as the first choice of exploration. The long-term aim of the company is to develop commercially viable, zero-emission vessels. The eventual aim is to combine renewable energy from wind power with bio-fuels,” says Gilpin. “Fuel prices are vulnerable to oil market volatility, but once the technology is developed, wind is free at the point of use. The first onshore wind turbines were single devices producing 45KW; now we’re seeing fleets of 10MW producing energy, without subsidy. We can expect to mirror that speed of transition in the shipping industry,” she continues. In summary, Gilpin states, “this is a project that could really make a difference. Working collaboratively with stakeholders from across the shipping system we can together scientifically identify and address big challenges. Drax’s determination to cut carbon emissions creates real demand pull for the shipping industry and Ultrabulk are to be applauded for tackling this ambitious challenge with us. Reducing emissions is good business. It saves costs and improves long-term operational certainty. But it isn’t easy. As a group, we are engaging stakeholders across shipping, working with port owners, shipbuilders, financiers to design pragmatic and effective new systems solutions. This initial 12-month feasibility study aims to find the ‘sweet spot’ between reducing emissions and saving significant fuel costs. The UK government’s Clean Maritime Council recognises the commercial opportunities arising from the industry’s need to decarbonise. A clean maritime plan will be published next year and will include policies to tackle emissions of air pollutants and greenhouse gases from shipping, while ensuring the UK can reap the economic benefits of the global transition to zero emission shipping. Drax Group CEO Will Gardiner says, “Smart Green Shipping Alliance’s pioneering efforts to deliver cleaner, greener transportation could help achieve the clean growth required for the UK to meet its climate targets. If we’re serious about meeting those targets, decarbonising transportation is the next big challenge. The innovation leads on the project are Rob and Tom Humphreys of Humphreys Yacht Design who will use their extensive experience in making technical advances in ocean racing, to help transform an industry that has used the same technology for the past century. Tom Humphreys says, “Transferring knowledge and technologies from offshore yacht racing to improve the performance of commercial merchant ships mirrors the way Formula One drives design development in the automotive industry. “We have worked on America’s Cup and Volvo Ocean Race campaigns, competing at the highest level. Applying this mindset and technology to the commercial shipping industry means that we are able to make very significant fuels saving advances”, says Rob Humphreys. Per Lange, CEO of Ultrabulk says: “We are looking very much forward to working with our partners at Drax and Smart Green Shipping Alliance. The feasibility study initiated is very much in line with the environmental focus of Ultrabulk and the shipping industry at large. Dr. Jenifer Baxter, Head of Engineering at IMechE says, “This is an exciting project that addresses one of the more difficult decarbonisation challenges and represents the ingenuity of engineering that the Institution of Mechanical Engineers seeks to support. “Shipping has been a part of our global transportation system for hundreds of years moving through wind and man-power to coal and diesel power. This project presents a new phase taking us full circle forward again to wind power, leading the way with state-of-the-art power and engine technologies enabling shipping to remain relevant and commercially viable in an increasingly low-carbon world,” she concludes.